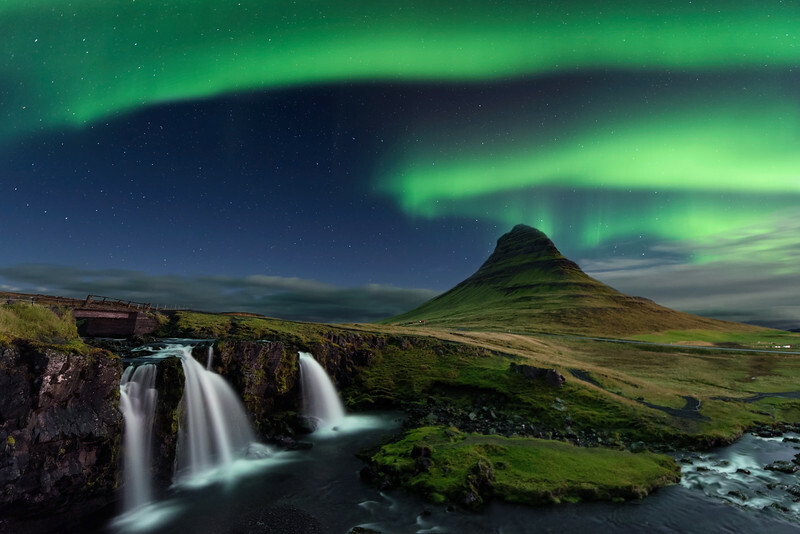 The magnificent mountain of Kirkjufell Iceland is the icon of the Snaefellsnes Peninsula. With its waterfalls Kirkjufellsfoss, it attracts nature lovers and photographers. 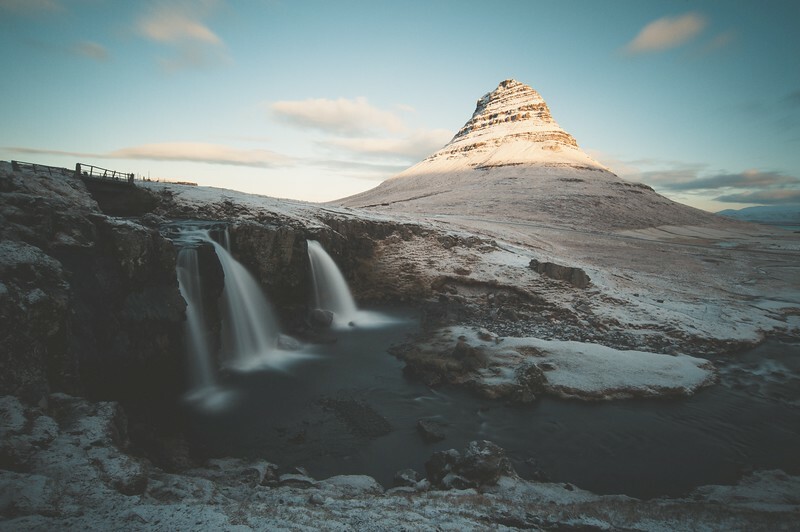 There is something special about the shape, location and colors of the Kirkjufell Mountain: green in summer, orange in winter, white with snow, under the northern lights, at sunrise, at sunset...Magical! Don't miss it on your Iceland road trip. 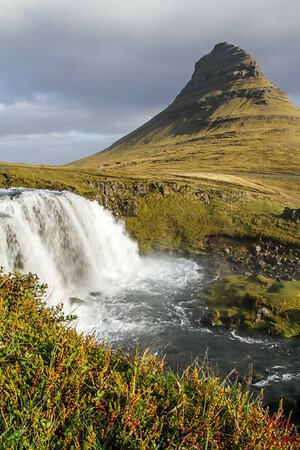 Kirkjufell is a 463 meter (1519ft) high mountain on the Snaefellsnes Peninsula. Because of its shape and stand alone location by the sea with waterfalls close by, it has become one of the most iconic landscapes in Iceland (and one of the most photographed). I really enjoyed it, and visited it under different weather conditions. I was always magical, so I selected it in my Top 10 Iceland Landscapes. Its name means "Church Mountain", because of its shape. Kirkja is the Icelandic name for church. 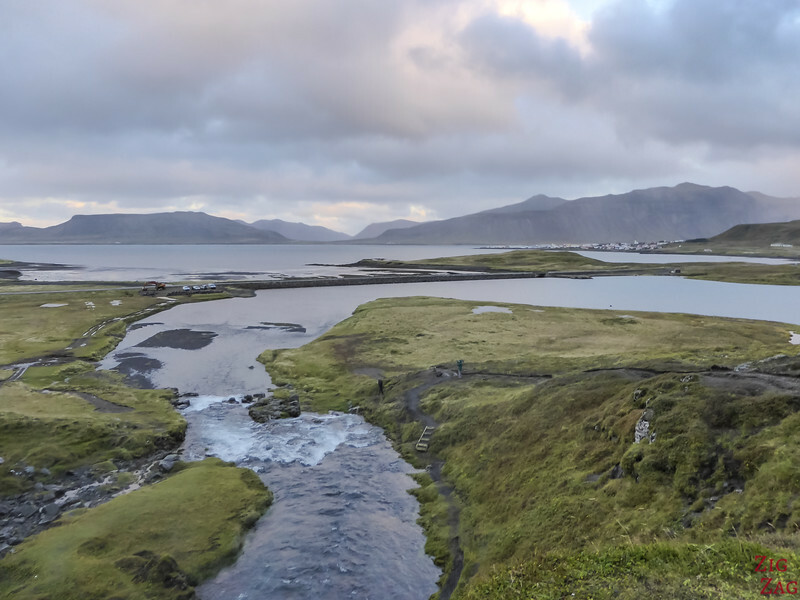 It is located on the North Coast of the Snaefellsnes peninsula (see the guide), just West of Grundarfjordur, one of the main towns in the region. It is 185km (114mi) away from Reykjavik. Under good conditions, it would take you 2h15 to drive there. Below is a map to help you locate Mt Kirkjufell. Because of its strange shape and the volcanic nature of Iceland, people wonder if Kirkjufell is a volcano. It is not. Just the work of time with sediments and erosion. See the next paragraph to understand how it was formed. Kirkjufell is a stack of layers of sedimentary rocks from glacial and interglacial stages. At the base is Tertiary Lava. And then it alternates between Sandstone, and Quaternary lava. At the top is tuff (a geological profile is available at the bottom of this article). And then during the last Ice age, erosion shaped it. Its side are so steep because it was a high rock pressured between 2 glacier tongues. 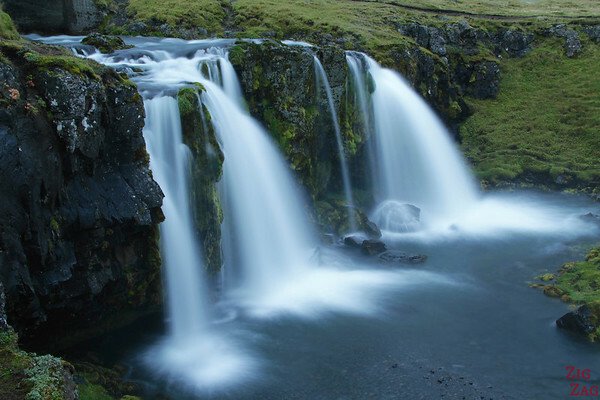 "Foss" means waterfall in Icelandic. Very close to Mt Kirkjufell is a series of waterfalls. The alignment is ideal to photograph all that together. They are located on River Kirkjufellsá flowing from the Snaefellsjokull glacier over the Helgrindur ridge. Both steps of the waterfall are not very high (they reach around 5 meters (16ft) in height) but the interest is the combined view with the mountain behind. 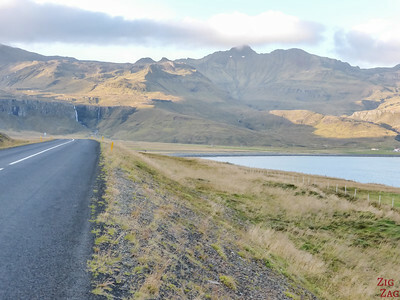 Where to park for Kirkjufell? When you approach the mountain, you will find a small parking area. Attention, surprisingly it is located on the side of the road opposite to the mountain. So if you arrive from the East, it will be to your left; and if you arrive from the West end of the peninsula, it will be to your right. KIRKJUFELL HIKE - Yes, it is possible to hike to the top of Kirkjufell (Kirkjufell hike). However It is a difficult hike with very steep sections, slippery rocks and wind. Do not go by yourself (it can be very dangerous, with people fatally falling). Hire an experienced guide who can take you through the right tracks. In any weather, the place keeps its magic! 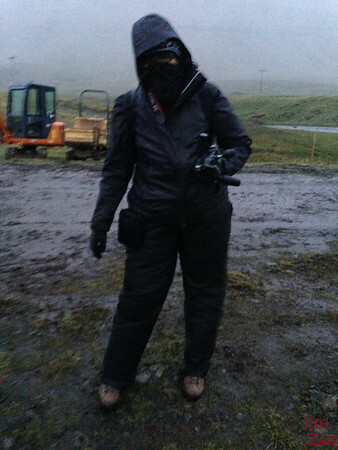 However know that Kirkjufellsfoss is a photographer magnet – don’t expect to be alone! With the reflection on the lake: at the bottom of the waterfalls there is a lake. 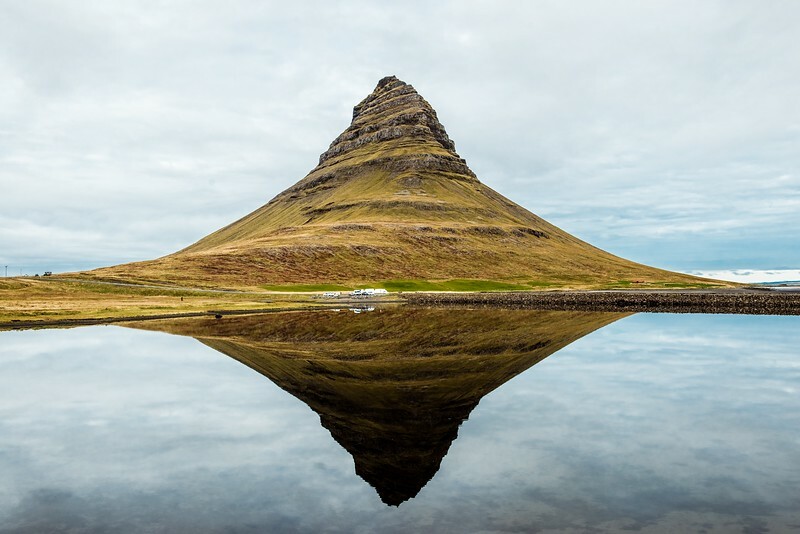 When it is completely calm, it shows an almost perfect mirror image of the Kirkjufell. Apparently you can go on higher ground for an interesting perspective without the waterfall. I have not tried considering the weather. This is one of my favorite viewpoints. Everybody rushes to the waterfalls but this is such a peaceful place! 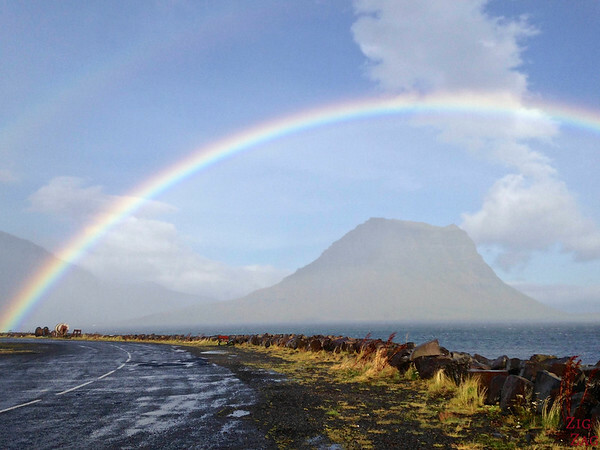 The following shot with the rainbow was taken from the town of Grundarfjordur near hotel Framnes. But just with my iPhone because it was pouring rain. Of course, like anywhere, the best times are sunrise and sunset. Because of its location facing North and the openness of the area, it is really good for both conditions. the position from the waterfall is facing North. Plus there are no strong sources of light so you could see them well. Learn more about tracking and photographing the northern lights on my special article. I stayed at 2 accommodations on the Snaefellsnes peninsula near Kirkjufell: The Old Post Office and Fram﻿nes. Check out my Iceland Accommodations article for more information and reviews. Framnes in ﻿﻿﻿﻿﻿Grundarfjörður: The location was great not far from the famous Kirk﻿﻿jufe﻿﻿llsfoss allowing us to get there at sunset and sunrise. 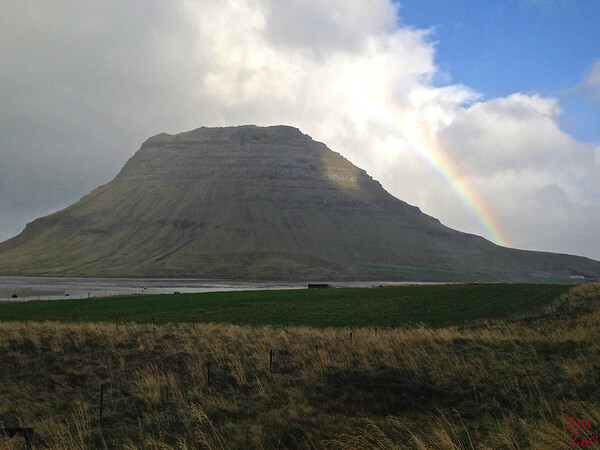 In the morning we were even greater by a beautiful rainbow over Kirkjufell. 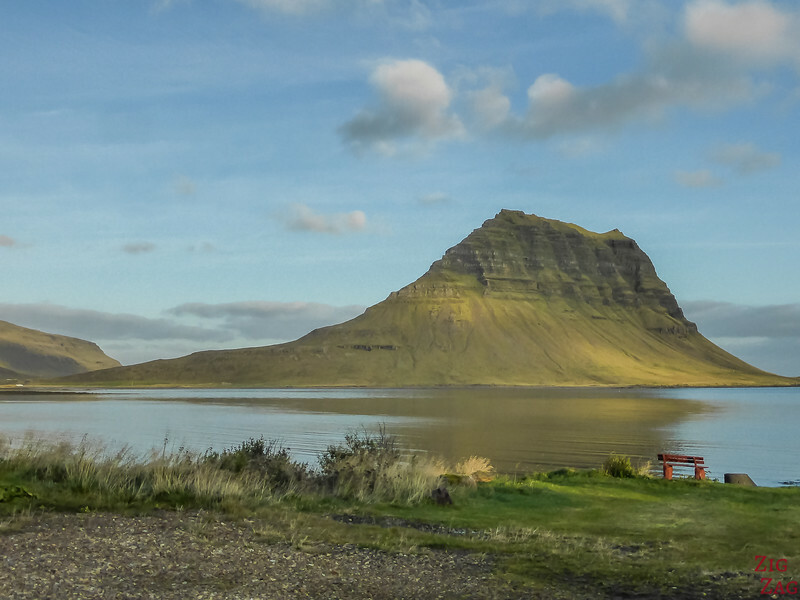 There is a campsite at Grundarfjordur near the pool. Check at the swimming pool reception. Kirkjufell Iceland is as magic Winter as it is in Summer. Below is a picture to prove it. You might be lucky to see it under the snow. But know that the waterfalls normally don't freeze. Accessing Kirkjufell in Winter - The road to get there is normally cleared to the waterfall carpark. But always be careful, it can be slippery. Don't forget to wear many layers of clothes. Don't climb it in Winter. 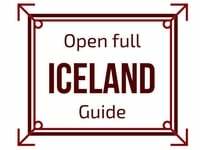 And if you are planning a trip to Iceland in Winter, check out my planning guide. Have you ever visited icons and felt disappointed? Loved your panoramas! Iceland is high on my list of places I would love to visit (if only it weren’t so expensive! ), in part because my husband and I really enjoy photography… it really seems like it’s one of those breathtaking places where it’s almost impossible to take a bad picture (even if the weather isn’t cooperating). I don’t think I had heard of this particular place in Iceland, but your pictures have convinced me that it’s somewhere we MUST visit. Very good information provided Claire. 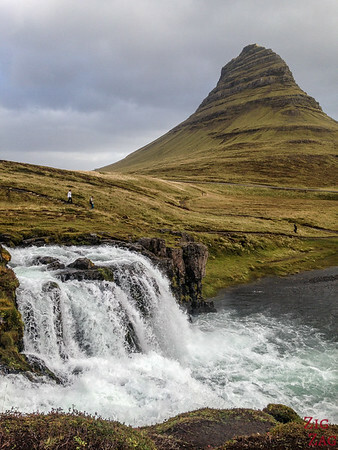 This post has put the visit to Kirkjufell Iceland on my Must See list. Thanks Srinath. Glad you found it helpful.